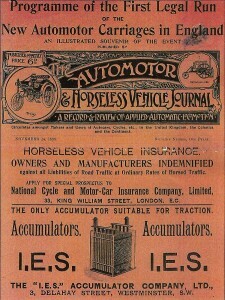 The famous Emanicipation Run of 1896, the drive from London to Brighton, now reenacted each year as one of the key events in British motoring history, was organised by a bicycle designer and bicycle company owner. Harry Lawson was the creator of the ‘Safety’ bicycle, the grand-daddy of today’s rear-driven low-mount bicycle with gears. The Rover Safety, designed by John Kemp Starley some six years later, is usually listed as the first modern bicycle – the rider was lower to the ground than on a highwheeler so was safer – but, in fact, he was beaten to it by Lawson. 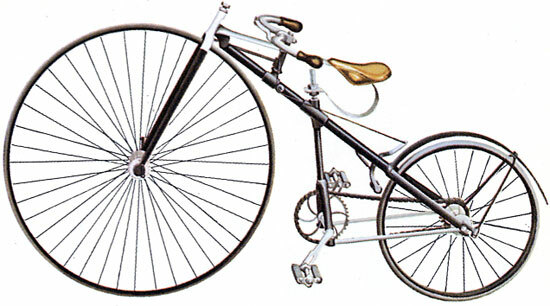 How did Lawson come to design a bicycle with smaller wheels than the penny farthings of the day? Perhaps his height? He was 5ft. Whatever his motivations, Lawson’s ‘Bicyclette’, above, of 1879 was ahead of its time: it was thought undignified, too complex, and although popular for a time in his home town of Brighton, it failed to sell nationally. Undeterred, Lawson carried on designing bicycles through the 1880s. (The name for his bike later became one of the French words for bicycle). It was to be held in anticipation of the soon-to-be-law Locomotives on Highways Act 1896, which allowed ‘light locomotives’ – motorcars – to travel at a speed of up to 14mph and to dispense with the need for a fellow to travel in front waving a red flag. Thirty three motorcars took part in the Run, seen off by a huge crowd, including many cyclists. 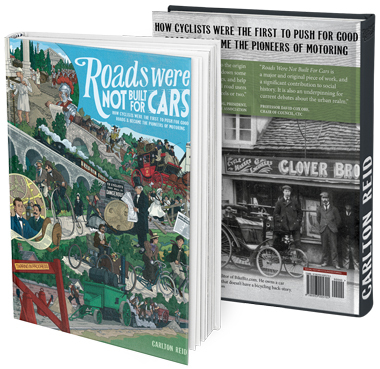 (Cyclists also followed the horseless carriages to Brighton, including Claude Johnson, one of the key figures of early motoring, the hugely-influential first secretary of the Automobile Club, which later gained royal patronage). Why Brighton? Because that was where Lawson first lived when he started in the business of making bicycles, working with James Likeman, with whom he collaborated on his first bicycle patent, in 1874. 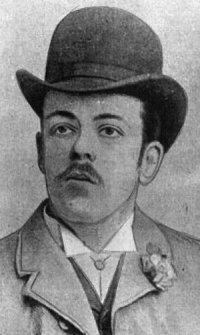 As a cyclist, Lawson would have been familiar with the popular bicycle excursion of London to Brighton. On Wednesday Mr John Mayall, jun., son of the well-known photographer, accomplished the journey from London to Brighton on one of the new two-wheel velocipedes. He was accompanied by two friends, Mr Spencer and Mr Turner, also on velocipedes. They had a preliminary run round Trafalgar Square, and then started off at the rate of eight miles an hour on roads which proved to be generally good, but against a very strong wind all the way. They kept pretty well together as far as Crawley (30 miles), after which Mr Mayall took a decided lead, and arrived in Brighton in time and in good condition for dinner, and the second part of Mr Kube’s concert at the Grand Hall. Part of the journey, down hill from Clayton to Brighton, was run at the speed of one mile in four minutes. While the first ride was long, and newsworthy, subsequent ones certainly were not. Four years later, members of the Amateur Bicycle Club of Middlesex, were riding the same route that had taken Mayall thirteen hours in only 5 and a quarter hours. They did this, on the poor roads of the day, on high wheelers, the red Ferraris of the 1870s. By the 1890s it was common for cyclists to ride to Brighton from London and then ride back the same day. When Lawson wanted a destination for his motor car demonstration he chose London to Brighton. Only 17 motorcars made it to Brighton, Lawson’s included. It’s the dirty secret of bicycle history that many of its early luminaries were only too happy to move on to work on the new motorcars – which were eventually to drive bicycles off the roads. Absolutely. Most thought of it as a natural evolution and that bicycles – a necessary but doomed stage – would wither and die. For the upper classes this was the case but then the bicycle became what Drais thought it might become and that was the “peoples’ nag'”. Town planners in 50s and 60s on thought even this stage would end so didn’t plan for bicycles. But bicycles always came back. There was a mini boom in the 30s in America (fuelled by Hollywood stars) and the 1970s touring bike boom followed by the MTB boom. Each boom confounds the naysayers. Now, ebike makers think ebikes will finally kill off all but sport bicycles. They are wrong. 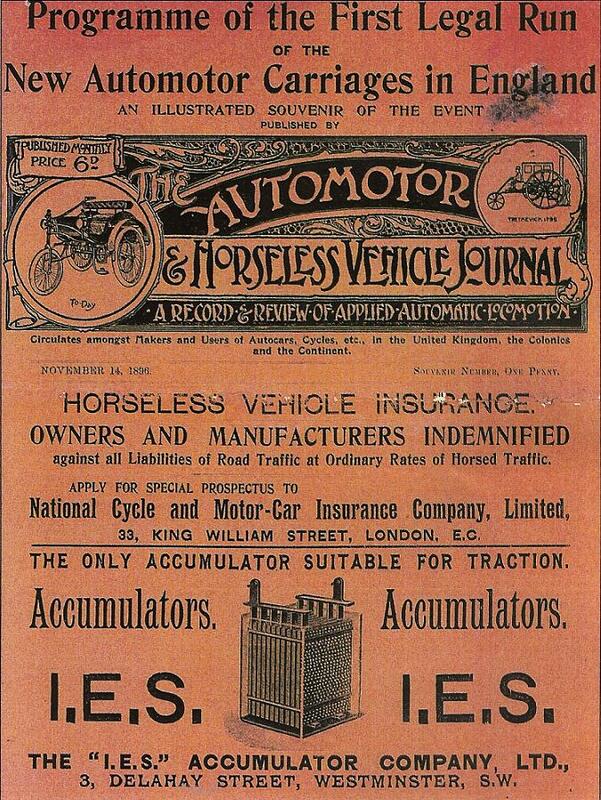 I’m sure the bicycle makers of the 1890s who helped kickstart motoring would be incredulous that cycling is in such rude health across the world and that it looks likely to stay that way.